It had been a while since my father-in-law had been fishing, so when he asked me mid week “Where shall we go fishing this weekend?” I jumped at the chance. Having slowly but surely fished my way around quite a few of the public fisheries in South Wales I knew of a few good venues to chose from. Jeff wanted to fish a lake rather than a pond and intended on spending a lot of time on the waggler. I knew just the place, and that place would be Lamby Lake. After a successful session previously with one of my friends I thought it would be a great location to target some of the specimen Roach and Perch which I know the lake held. A bit of a walk, but I found a great looking peg! Arriving at the lake just after half 9 we were very surprised to see that a lot of the pegs we intended to fish were already taken (including the one I had previously fished in between a huge patch of bull rushes). Fortunately the path around the lake is flat and easily walkable, and as we both had trolleys we loaded up our gear and set off searching for some empty pegs. A 20 minute stroll to the other side of the lake and we had found 2 pegs that looked quite fishy. Compared with the weather we had been experiencing recently, today was warm and sunny, which meant the glare on the water might create problems spotting the float later on. 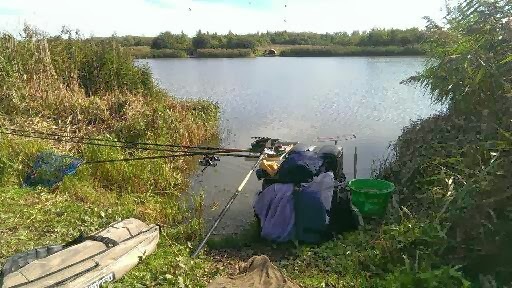 Setting up a light waggler rod and a straight bomb outfit, I plumbed up and lobbed in 4 large balls of Supercup to get my swim going. 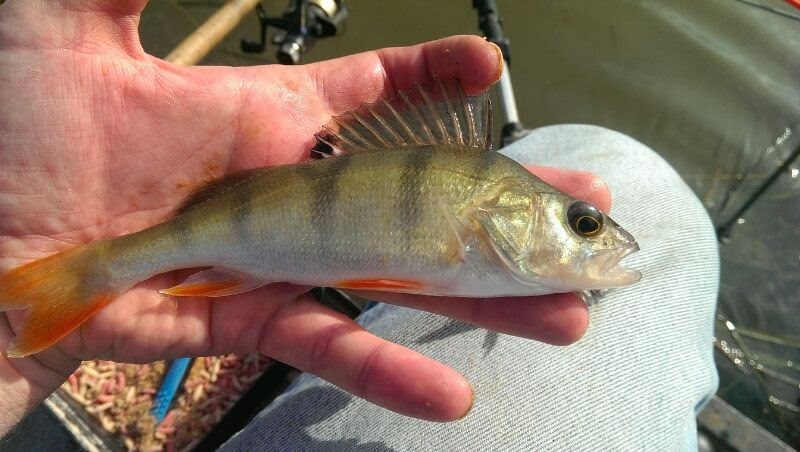 I would also be fishing prawn and worm on the ledger rod to try and tempt out some of the larger Perch. Casting out, the bite frequency depended entirely on feed rate, and after a few small pouchful’s of maggots were fired in, the float slipped under the water. On striking I was into the first fish of the day, a beautiful Rudd of a few ounces. The bailiff was also on his way around and seemed surprised that I would be fishing for silver fish, but took my money and wished me luck. The Carp in this lake are wary, but one of the bite alarms of the angler to my right soon came alive and he brought to the bank a lovely common Carp of around 16lb which I helped photograph. Getting back to my swim, I cast back out and began the waiting game once more. I had begun to notice that the fish were holding off the back of the swim, and only when casting slightly beyond where I was feeding were the bites a lot more positive. Double maggot and worm segments were doing the business and I was successfully catching good quality Roach, with the occasional Perch when the tow moved my bait off the bottom. 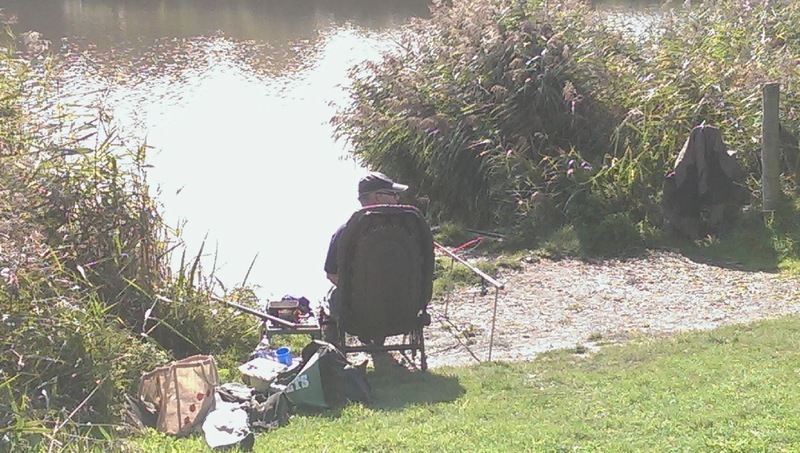 I thought I’d see how Jeff was doing, and when I walked over to his peg he was busy catching quality Roach and Rudd. There was an underwater feature on his peg, an old stream which caused his swim to vary in depth from 4ft to 5½ft. When his bait landed in the stream bed his bites were very positive and he picked off 2 scale perfect Rudd while I stood and talked to him. One thing was for sure, the lakes depth varied quite a lot. My swim ranged from 3ft – 4ft, and with the tow I fished at roughly 4½ft, whereas Jeff was fishing up closer to 6½ft. He could hear me approaching! Envious of his swim and the Rudd he was catching I headed back to my peg, re-baited and cast back out. I also lobbed out my ledger rod with a prawn hook bait. It immediately dropped back and winding in I found the perch I had hooked was the smallest of the day! Using a larger section of prawn I cast out and turned my attention back to the waggler rod. Get your bait over depth and you’ll get loads of quality silver fish. The bites were very steady but quite delicate, and after missing 2 fish I switched hooks down to a size 18. This made an impact and now I was connecting with every bite. 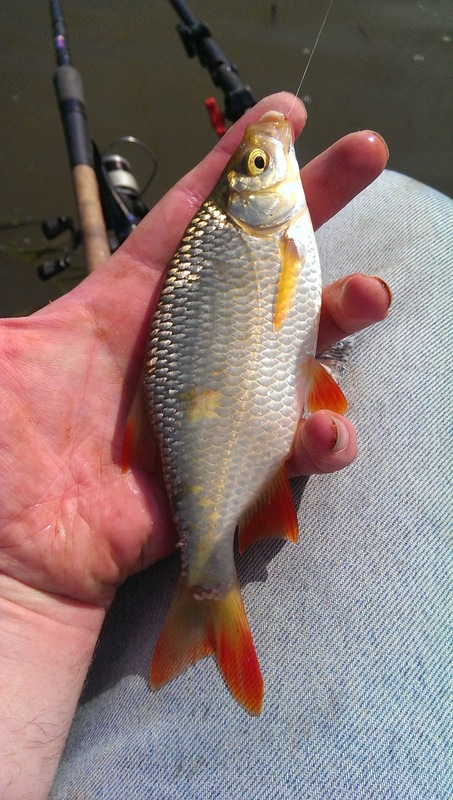 The fish in Lamby Lake are of such high quality I caught a number of Roach, all well up over the 12/13 ounce mark. My ledger rod started registering a slight knock and on striking I connected with a slightly larger Perch, but far off specimen standards. Maybe I should go with the bigger bait approach! I cast back out with a whole prawn on the hook and set my rod down, waiting for a predatory lump to come calling. Not a specimen but certainly a greedy bugger! The under tow in this lake had started pushing my rig towards me, so re-casting regularly to maintain bites was essential. The fish also seemed to be coming in waves, with 5 – 10 minutes of constant fish, followed by a quiet 5 minute spell. After 30 minutes (and lunch) Jeff came walking up the bank. He was very pleased with the size of Roach and Rudd he was catching, but had to go down to a size 22 to keep hitting his bites. We had a quick chat about what baits we had tried, and only Maggots and Worm seemed to be consistent in getting results. I re-baited my waggler with a small worm segment and within seconds of being in the water my float vanished. 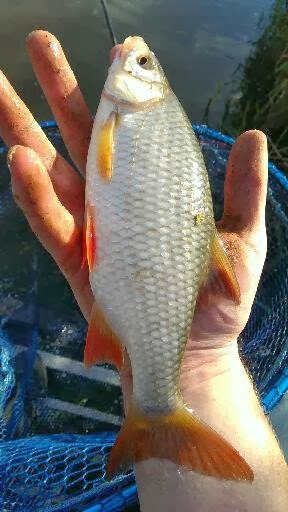 I was into another great Roach, I was starting to regret not bringing a keepnet. My ledger rod however remained dormant. I would have had a net full of this size fish! 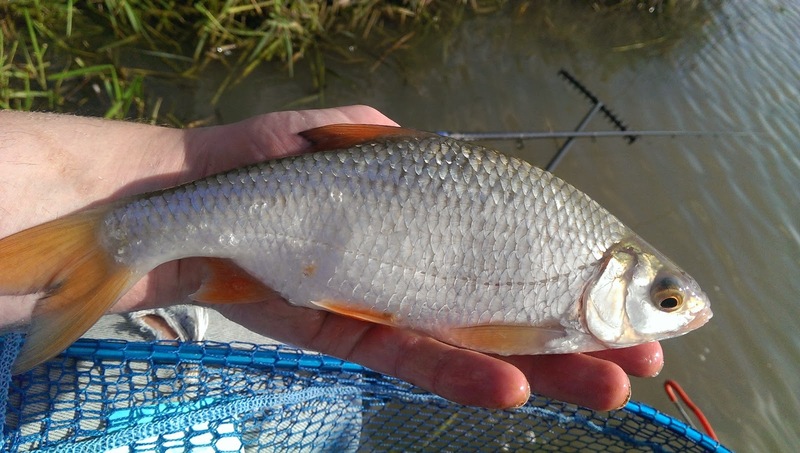 I continued to steadily catch Roach, Rudd and Perch until we called it a day at half 4, and was very pleased with the number of fish I had caught throughout the day. 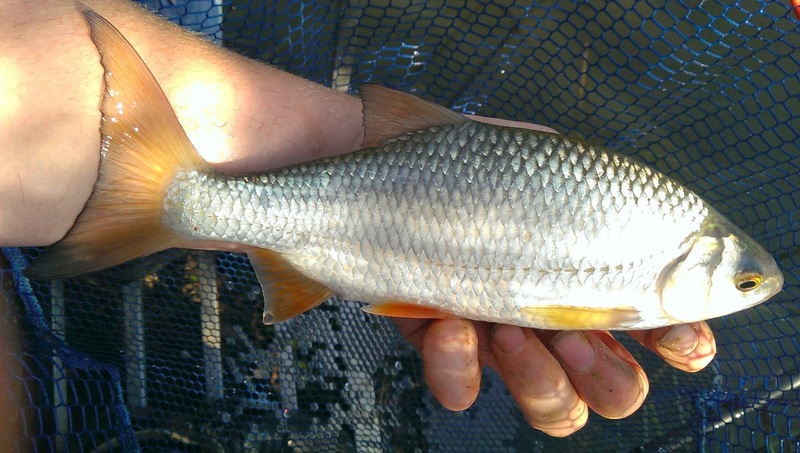 After fishing Lamby Lake twice I am convinced that there are numerous PB Roach and Rudd to be had from the venue. This was confirmed by the Carp angler who was fishing between us. He joked that he had caught some of the larger Roach and Rudd, as they had no qualms in taking boilies up to 12/14mm! (A thought for next time?) With my trolley fully loaded I walked towards Jeff’s peg and he too had just packed up. “The last fish I just caught was a huge Roach. I called it day after that!” After a few questions it seems as though the fish had caught was over 1½lb’s, a great fish by anyone’s standards! I was actually annoyed that I hadn’t packed up sooner so I could have taken a photo. Still, confident that one of us had secured a new PB, we walked back to the car incredibly pleased after our busy day of fishing. Next story How to connect a Dacron Connector to Elastic. Previous story Trip #44 – Tri-Nant (Mixed Lake) – Fortune favours the bold!